Currinda accommodates numerous payment gateways, including Eway Australia. With your Eway credentials handy, navigate to your Currinda ‘global’ settings tab (->Misc sttings) on the RHS tabs menu, then select ->Payment Gateways. Choose an appropriate name for your gateway setup for reference purposes, and enter it into the ‘Name’ field. 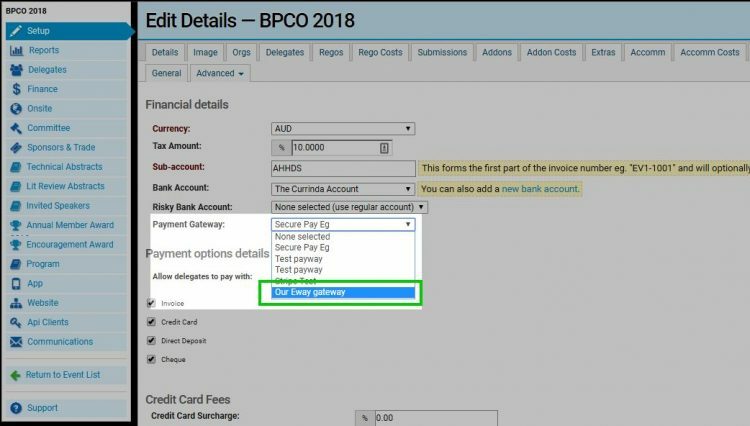 Next, refer to your Eway account details and populate the remaining fields displayed (be sure that Eway Australia is selected for the ‘Type’ field dropdown menu). You’ll now find your newly created payment gateway is added to your global list of availably gateway options in your Currinda portal. Now that you have your Eway gateway established in your global settings, you are able to easily apply this gateway to any event (eg for registration payments, sponsorships etc) or organisation (eg for membership renewals, member addons, etc). Here, all your Event-specific (or organisation-specific) financial settings can be applied from the attributes you’ve already established globally (in the ->Misc settings tab) for your Currinda portal. In this case, we want to apply the Eway gateway for our event (to enable transactions like credit card registration payments, refunds, etc), so we open the ‘Payment Gateway’ dropdown menu and select our Eway option.